The customized low hosebeds are known as “FDNY-style”—one of a number of innovations pioneered by New York firefighters. The model even depicts different-size hose diameters for different tasks. cab and the wider of the two con­figurations, giving the maximum amount of interior space for the crew and their equipment. Known as the “Eagles,” Engine 45 carries a prominent 3-dimensional eagle emblem on the front of the truck between the windscreen and the grille, painted representations of the company emblem on the side of the cab, and “Eagles” is spelled out on the right front bumper. 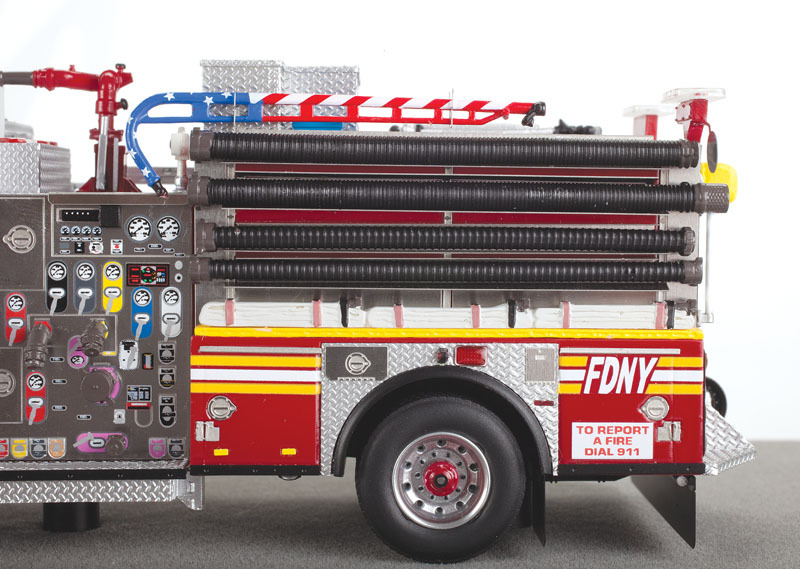 The engine-company number script is painted on the grille, flanks, and tail panel of the KME, and various other FDNY insignia as well as a plethora of identification and warning labels are all around the model. Other standout features on the model are among Fire Replicas’ specialties: the stainless-steel control panels for the crosslay discharges and internal water-supply tanks are brilliant. There is a top-mounted turret monitor in the middle of the truck just above the control panel, and we love how the box just in front is carefully notched to clear it. While you are admiring the roof features, take a moment to look at the sophisticated array of lights on top of the cab; each individually molded light bubble has bulb detail molded into the center! The 20-inch extended front bumper has a carefully molded hose laid into the storage compartment, and it snakes over to attach to its own discharge on the left front. Below that are the impressively thin-gauge stainless-steel steps and grab handles for accessing the cab. And Fire Replicas’ treatment on the wheels and tires remain the standard at this scale. This model has Fire Replicas’ usual excellent control panels and wheel detail, but a new and interesting feature is the separately cast “NY High-Rise Nozzle,” painted with a stars-and-stripes motif. 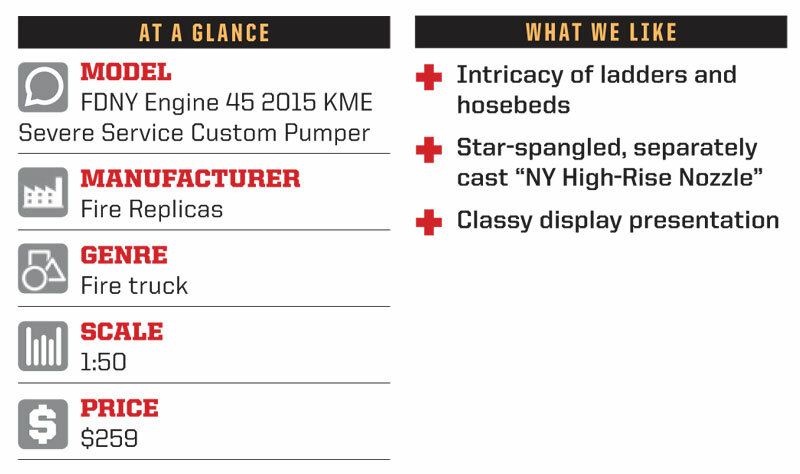 Fire Replicas has turned researching these trucks into an entertaining little game for us. We comb over photos and video of the unit upon which the model is based, and the harder we look the more the company’s brilliance shines. We just can’t trip them up! Fire Replicas’ mission is to build models so detailed that collectors see something new each time they examine one. The 475 individual parts in each model help ensure that that goal holds true for us. That number is more than twice the number of units that will be produced—just 220 total—of Engine 45, which helps ensure that the model will be as collectible as it is detailed. 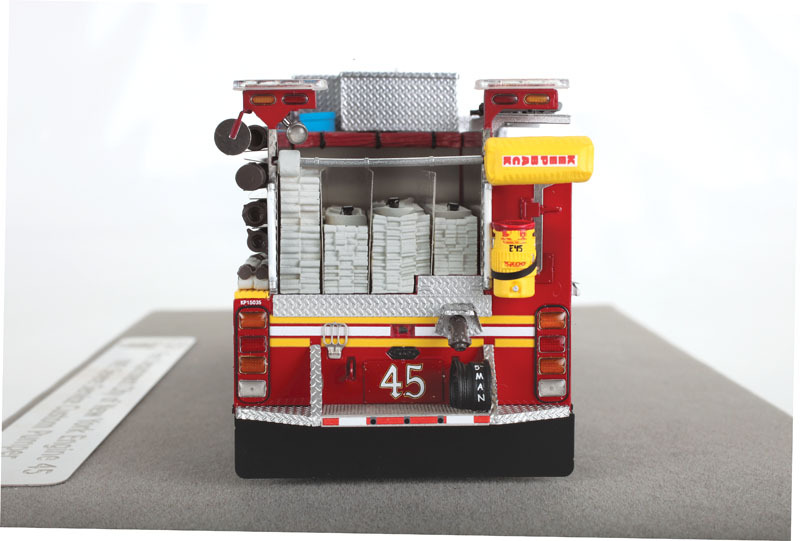 We have yet to be less than impressed by any Fire Replicas’ piece; this one has the cachet of the FDNY behind it, making it a winner for any collector. 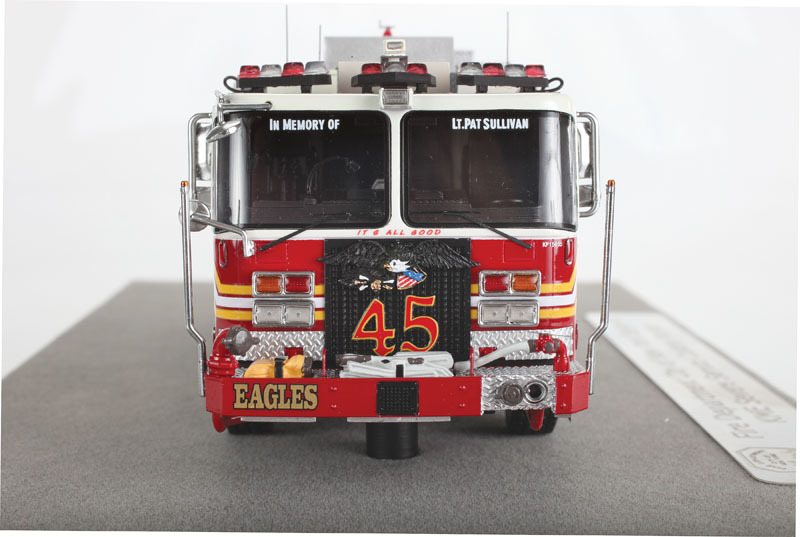 The nickname of Engine Company 45 is the “Eagles,” and you can see that symbolized by the emblem mounted above the grille as well as the script on the bumper. Take a look at the detail on the hose that snakes from the storage bin to the monitor on the left front.